My local London barista always asks me to say “There’s been a Murder” in my thick Scottish accent. The catchphrase, whether it was ever actually said or not, is attributed to the popular TV series Taggart. But the writer of that detective drama, Glenn Chandler, is better known in the theatre world as a playwright and novelist. His latest stage adaptation is Lord Dismiss Us, based on the novel by Michael Campbell, which is premiering at The Edinburgh Fringe fifty years since the books publication. It’s also fifty years since the partial decriminalisation of homosexuality and that’s where the piece draws inspiration, because it is set right before the parliamentary vote and public opinion is divided. Firmly against it, we assume, is the new Headmaster of Weatherhill Public School and his wife, who between them are determined to purge any trace of homosexuality from the school grounds. They’ve got a job on their hands, the fourteen Masters are all bachelors, and the boys themselves seem to spend far too much time ‘down by the lake’, even the Chaplain has male nudes hanging on his walls. To make the job even harder, new boy Nicholas Allen, played wonderfully by Joe Bence, catches the eye of Terry Carleton, who’s been having occasional liaisons with Peter Naylor (Jonathan Blaydon). The over use of stereotypically camp characters may upset some, but I think it’s necessary to keep the comedic element of the play. Removing that element would take the play into darker territory, especially in scenes involving teachers and students. While Lord Dismiss Us is incredibly funny in places, it’s also deeply touching in others, this is primarily down to some strong performances amongst the cast. The person sitting next to me didn’t realise until the curtain call that the Headmaster and Chaplain were in fact both played by the same actor, David Mullen. Joshua Oakes-Rogers is exceptional as Terry Carleton, initially I feared the character had been written too effeminately, but Oakes-Rogers manages to tease out a vulnerable side to Carleton, particularly during the diary pieces straight to the audience. 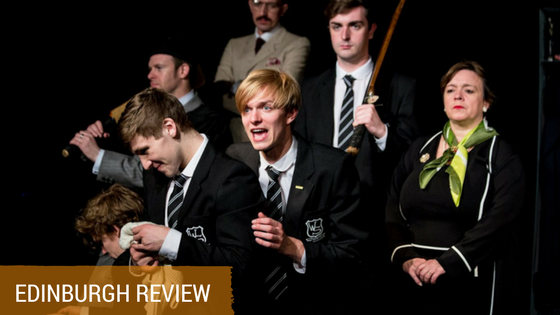 Lord Dismiss Us is a fantastic comedy drama which takes a very serious issue in our country’s past and allows us to laugh at it with just the right amount of farcical embellishment. Cleverly adapted and beautifully performed, Lord Dismiss Us is the embodiment of inclusive theatre, because it can quite genuinely be enjoyed by everyone and anyone.